Physical examination of a dog on regular basis is a very important things and this importance should never be underestimated. 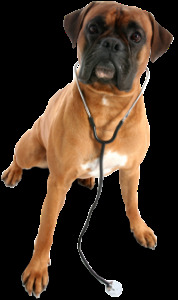 A regular checkup of your pet by a qualified veterinarian can diagnose most dog diseases affecting your pet. the lack of regular physical examination can lead to your pet's health being neglected and you will not find out if your pet is suffering from any disease. Observing your pet for behavioral changes like scratching, laziness or limping can lead to the diagnoses for several disease. These symptoms and behavior changes will tell you something is wrong and a physical examination will establish what is exactly wrong with the dog's health. for example a dog might be itching itself and because you notice the itching you examine your pet, you might just find a wound under the fur that is the cause of this itching, once the problem is diagnosed it is easy to find a cure and treatment for the problem or disease. Some other important diseases can be diagnosed by physical examination these can include wounds, the presence of external parasites like lice and ticks and thus physical examination will lead to a diagnosis and cure for your pet. Just like this physical examination can help you find out a lot of problems with your pet, sometimes for minor problems you can examine the pet yourself. Sometimes a professional can physically examine the pet and diagnose the disease and offer treatment. We as pet owners should know the importance of a physical examination in a dog and have our pet regularly examined by a professional and qualified vet. This will lead to a good health for your dog and give it a comfortable and long life.